Admiring that India and China are the emerging superpowers in Asia, Ambassador of the State of Kuwait to India explained that Kuwait, India and China should collaborate constructively to build strategic partnerships besides exploring the two initiatives of the “Belt” and “Road” initiatives. Emphasising on the ancient roots amongst the three regions of India, Arab World and China with specific reference to India-Kuwait relations, Jasem Ibrahim Al-Najem, Ambassador of the State of Kuwait to India recently stated “these ties will have a bright future in the current scenario”. 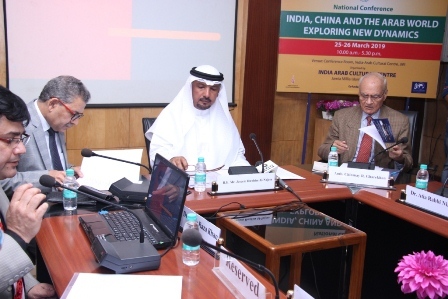 “China’s recent policy for economic expansion through the revitalisation of ancient silk route needs more exploration so that it could be accessed by different centuries and establish better bilateral and multilateral relations,” said His Excellency Al-Najem as he inaugurated a two-day National Conference ‘India, China and the Arab World: Exploring New Dynamics’ at India-Arab Cultural Centre (IACC), Jamia Millia Islamia (JMI), New Delhi. Referring to the use of “common currency in both the countries” as a reflection of the extensive economic and cultural collaborations, the Ambassador added, “this conference is a reflection of a unique confluence of multi-diverse and multi-perspective themes around India-Arab World and China’s relations” . Admiring that India and China are the emerging superpowers in Asia, Al-Najem explained that Kuwait, India and China should collaborate constructively to build strategic partnerships, strategic transformations into diversified trade, exploration of two initiatives of overland and maritime Silk Roads called the “Belt” and “Road” initiatives, and economic treaties in order to create opportunities of further opening up of markets for free trade in the region. He also hoped that the bureaucratic hurdles from Indian part in the implementation of open trade policies between India and Kuwait will soon be neutralised with the constructive policies of current political regime in India. Al-Najem stressed that the theme of the conference has captured the most relevant issue of the contemporary globalised world and hoped that it “will open a forum to discuss multiple aspects of the emerging configurations in the region”. Honourable Ambassador Chinmaya R. Ghare Khan, India and special envoy for West Asia and MEPP, chaired the session. Followed by a formal welcome address by A. P. Siddiqui (IPS), Registrar, JMI and introductory remarks by Dr. Nasir Raza Khan, conference convener and the officiating director of IACC, Dr. Khan delivered a special lecture and opened the working sessions of the two-day conference organised by JMI in collaboration with Indian Council for Social Science Research and Indian Council of World Affairs. In seven working sessions of the two-day conference, forty five papers were discussed. Siddiqui highlighted the contributions of Kuwait Embassy in the Centre’s development. He also enlightened the guests about the dynamic activities of the Centre not only in the field of culture and cultural studies but also in organising academic seminars and conferences around important issues like policy interventions and relevant international issues. These were China’s expectation to be an active player in the global trade through economic expansion; upgrade domestic industries especially in the field of energy and to fully utilise the unutilised manufacturing capacity; defending China’s assets and large skilled population through technology transformation, combating domestic ‘terrorism’ by developing new partnerships in the region, and to expand its military base in the region. The speakers further added that the political regime of Kuwait in Arab World is “a unique mixture of monarchy and democracy” where the parliament functions to assert for people’s rights with full freedom as and when it is required but at the same time, these assertions are democratically addressed by the Monarch.